Dobermans are a strong, graceful and agile breed. Their lean frame is packed with muscles. To make sure they stay healthy and in good shape, you’ll want to feed them the best dog food for Dobermans. Of course, you may just choose to go with any large breed dog food available. In some cases, that will probably work. However, to get the optimal blend for your pet, choosing one with high amounts of protein is crucial. Dogs are carnivorous animals. That’s how nature and evolution made them out to be. And big, muscular dogs like Dobermans require high concentrations of protein in their diet to sustain their muscle mass, strength and power. Below is our list of the dog foods for Dobermans. These are recipes they’ll like to eat. And, just as importantly, will provide them with the needed nutrition they need. Aside from protein, these blends come with a good balance of healthy fats, vitamins and minerals. Here’s a link that will take you to Amazon.com’s page of its top rated dog food for Dobermans. This Merrick brand’s of buffalo and sweet potato blend comes grain free. This increases the amount of protein in the mixture, which makes it ideal of strong, muscular breeds like Dobermans. This dry dog food recipe offers a high protein diet. This makes it one of the best dog foods for Dobermans. In each serving, your pet gets 70% protein and 30% vegetables. In addition, there are no fillers found in the mixture. And, as mentioned earlier it is grain free, which is great for dogs with allergies. What you get with each package is just real meat and produce. These ingredients are what work best to sustain your dog’s energy levels. In fact, buffalo is the first ingredient in this food blend. This ensures that what your dog gets is a diet that is high in protein yet lean. Added Glucosamine and Chondroitin also help support healthy joints as your dog ages. They are likewise important in working to delay the onset of arthritis, or reduce their severity with continued use. This diet also comes with Omega 6 and Omega 3 fatty acids. Both of which keep your dog’s coat shiny, healthy, and may help reduce shedding. This food also has added probiotics to help support a healthy digestive tract, which is important in any dog. While many know Paul Newman as a film legend, the younger generation know him better for his food products. These include sauces, popcorn and dog food to name a few. This is one of the dog food offerings under his line of products. This Newman’s Own dog food is designed for adult dogs. It contains a balanced diet, and is made in the USA. The blend contains real meat as the first and main ingredient. This is something very important to look for in pet food. That way you know you’re feeding your pet real, whole protein, and not byproducts. As mentioned, the mixture is designed to support the needs of adult dogs. It is made with organic grains. And they made sure to keep pesticides and potentially harmful chemicals out of your dog’s food. The product also comes with important Omega 3 and Omega 6 fatty acids. These healthy fats work to help maintain a healthy and shiny coat. The food is made without any artificial colors, flavors or preservatives. And, it does not contain wheat or corn, which can be allergens to some dogs. You may also want to know that the formula is considered a holistic food. And, it is devoid of any hormones, antibiotics or added chemicals. You can feed with confidence that the food is of high quality and carefully made. This product is offered in 4.4 pound, 15 pound and 30 pound bags. However, for bigger breeds like Dobermans, going with the bigger package helps reduce going back to the pet store regularly for refills. We like AvoDerm’s recipe blend of natural chicken meal because it contains no corn, wheat, or soy ingredients. All of these ingredients, when present in food can trigger or aggravate dogs with food sensitivities or allergies. Without them, you won’t need to have to worry about messes from your dog’s throwing up or diarrhea. They also save you the worry because your pet isn’t feeling well. This blend also does not have animal by-product meal, which is often considered an inferior protein source. What it does boast of is quality proteins to support lean muscles and good energy. Your pet also gets precisely balanced Omega 3 and Omega 6 ratios which nourish their skin and coat. If your dog suffers from skin conditions or allergies, this food could be a great option to naturally support their needs. The inclusion of whole grains and avocado provides natural fiber to the diet. The adult dog food formula is fortified with ingredients to support healthy digestion as well. Unlike most of the other products in this review, this is a canned dog food. 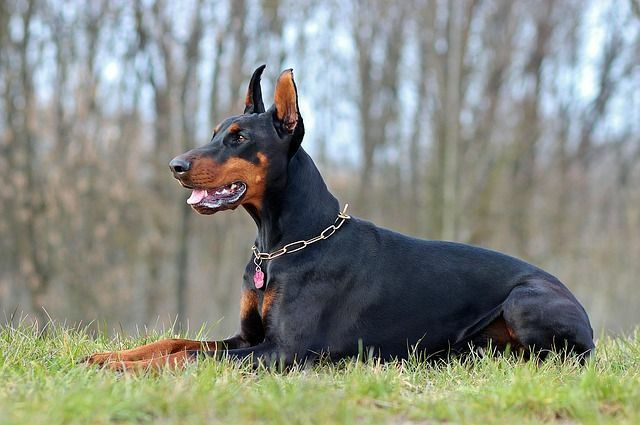 And while it differs in its form, it offers similar healthy formulation to give your Doberman the nutrition it needs to be healthy, strong and live long. Each package comes with 12 cans. And you have a number of flavor varieties to choose from. These include organic turkey and chicken, along with a combination of healthy carbs and veggies. We like this product because it not only gives you whole, natural food, but also those that are organic. Castor & Pollux Organix is a USDA certified organic dog food that is made in the USA. Organic means you can feel good about feeding your dog a food free of pesticides, other chemicals. The meat used is also organic. This means no antibiotics, hormones, or other chemical additives were given to the animals used to make the blend. Aside from offering a healthy diet for your dog, this soft food formula is also ideal for dogs with dental disease or missing teeth. The reason being that is easier for them to eat compared to kibble or anything else where they have to chew a lot. Good for any adult dog as it is formulated with vitamins and minerals to maintain good health during all life stages. Its turkey and vegetable formula is created to taste great and digest well. And, it is made with only high-quality and carefully sourced ingredients. Never any added colors, flavors, or preservatives. Is Canned Chicken Bad for You? Are Corn Tortillas Bad for You? What is a Bland Diet? Chicken and Rice Diet: Does it Work? Is Chinese Food Bad For You? Brown Rice vs. Wild Rice: Which is Healthier?